Outfit of the Day: High Waist Trousers! Details are key to any outfit and I love a good bow. Tie a thin scarf through your belt loops to create a fun one-of-a-kind belt, or tie a sash into a bow for a classic, sweet finish. 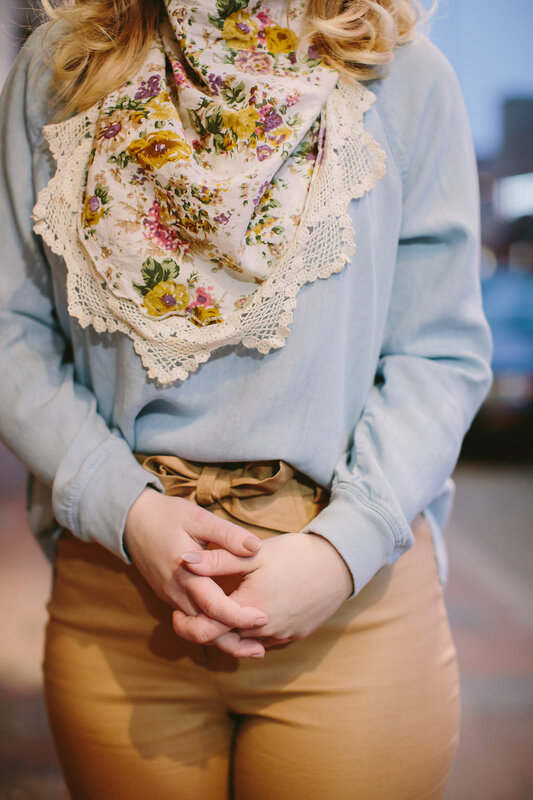 A printed scarf like a floral-to-lace, polka dots, or mixed stripes is an easy way to add a little casual fun to a work look. A mini crossbody bag is a great solution to switch your outfit from day to night when you unhook the strap and take your now-clutch out on the town! Finally, a classic comfy pump is the perfect last piece to complete your look! A high waisted pencil trouser is a curvy girls best friend! Finding a pant that equally flatters your figure while also highlighting what you’ve got is a confident must. 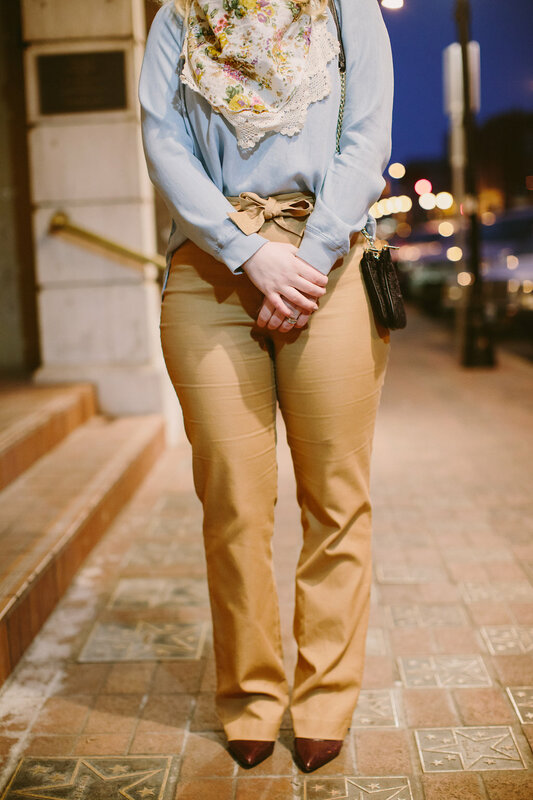 A neutral but light colored pant is a great start to building a versatile wardrobe that can go from the office to lunch with the girls! Trend alert: Chambray! The great part about owning about a dozen variations of chambray dresses, tunics and vests, is the season-to-season versatility and simplicity of it. 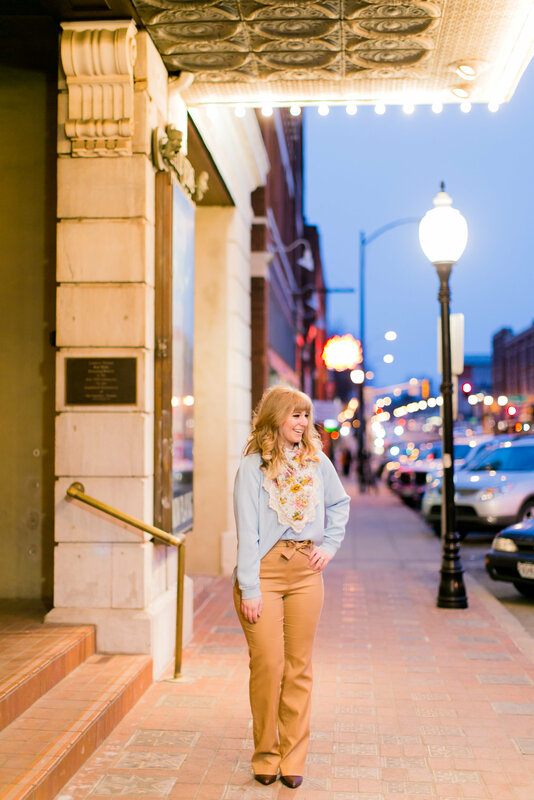 A light chambray like featured above is a casual and feminine style update for your wardrobe this spring! Half tuck in the front and belt it, while leaving the back flowing for an easy fix on over sized tunics like this one. Tip of the week: Keep it simple! 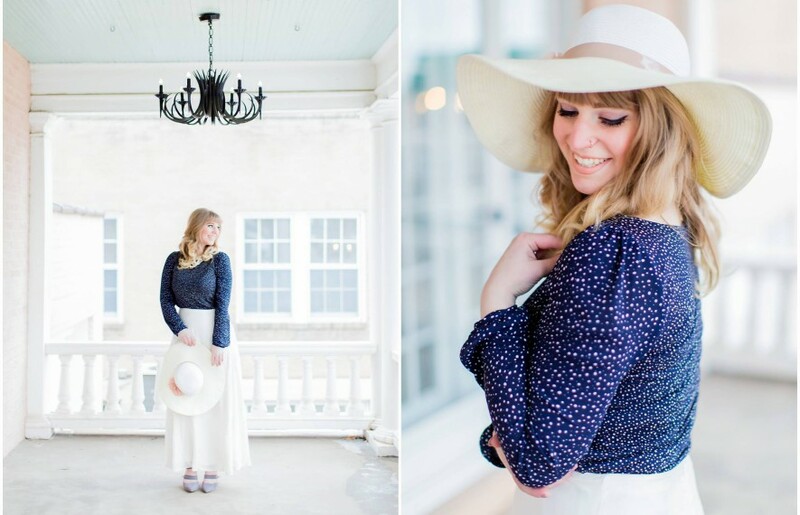 Mixing prints and layering multiple tops is one of my FAVORITE things in fashion, but sometimes pairing just 2 or 3 really stellar pieces is all you need for a fresh, modern look. Last week I had the incredible honor of getting to meet and work with the majorly talented Megan Kelsey Marcus & Meredith Sledge! These ladies are filled with so much talent and passion for what they do! To see more outstanding photos, posts and inspiration, check out their blogs and make sure to like them on Facebook and follow on Instagram!